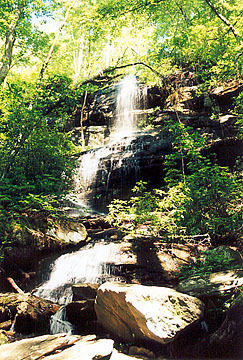 Hidden Falls is a 50-60 foot high cascade accessible from the Foothills Trail trailhead at Oconee State Park. 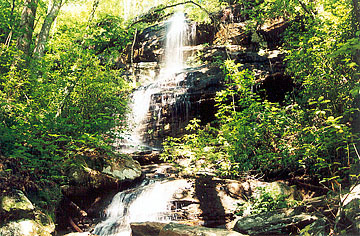 Three trails start at the trailhead: the yellow-blazed Hidden Falls trail, the white-blazed Foothills Trail and the red-blazed Tamassee Knob trail. 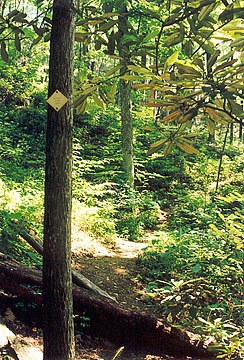 From the trailhead, hike the combined trails for .4 mile to the intersection with an old road and cross. Just past this intersection, the Tamassee Knob trails turns right while the FT and Hidden Falls turn left. Hike another mile to another old road. The Hidden Falls trail turns right onto the old road while the FT bears left and crosses the road. After a 100 yards, the Hidden Falls trail bears left off the the road. Follow for another .5 mile to the falls. This last section has a couple steep sections, otherwise the two-mile trail is easy to moderate. Directions: From Walhalla, take SC 28 west for 10 miles to its intersection with SC 107 and turn right onto SC 107. Drive 2 miles and turn right at the Oconee State Park entrance. Follow signs to the campground. At the campground entrance, bear left. After a couple minutes more driving, the trailhead will be on the left and the small parking area will be 200 feet further down on the right.